← I Needed New Black Boots. My Washer Got a Gray One Instead. Last weekend we were trapped in our houses for days. The kids got to miss two days from school. (The cheering will stop when June hits and those two days are tacked onto the end of the school year. Where’s the love for ice/snow days then? Huh?) Work didn’t stop for the adults though. Sigh. It’s the storm now known as Icemaggedon. The Weather Channel is naming winter storms like they do hurricanes…anyone else notice that? I like Icemaggedon better. A week later and a couple of days over freezing (finally!) we still have clumps of ice on the ground. It’s not even winter yet. I’m done with cold. All you Yankee types (anyone who lives north of the Red River is a Yankee type) can laugh at me if you want to. I won’t be offended. 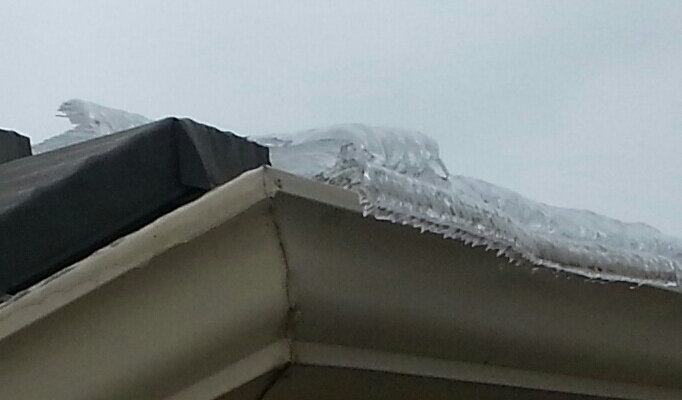 Icemaggedon left a thick layer of ice on our aluminum-shingled roof. When it melts just right, the ice will slide off in sheets. The sound inside the house is like thunder. The ground outside is a mess. It’s a good reminder to never stand or park your car in the ice-slide zone. This is how the ice landed on the side of the house. I call it Icehenge. Icehenge stood like that for days! 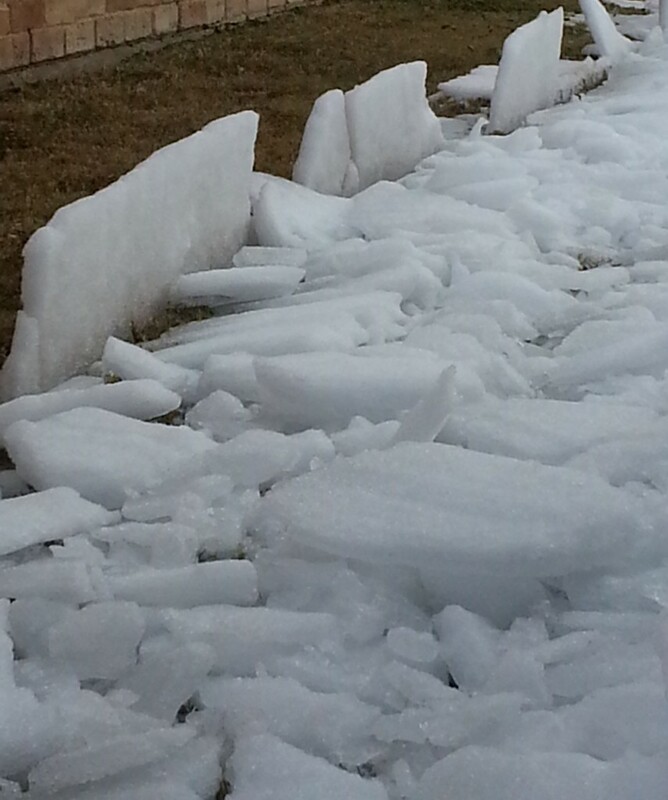 This is what our clean, dry driveway looked like after an ice slide. I was glad a friend who had just been visiting didn’t have her car parked there. This was the coldest winter event we’ve had since 2011. 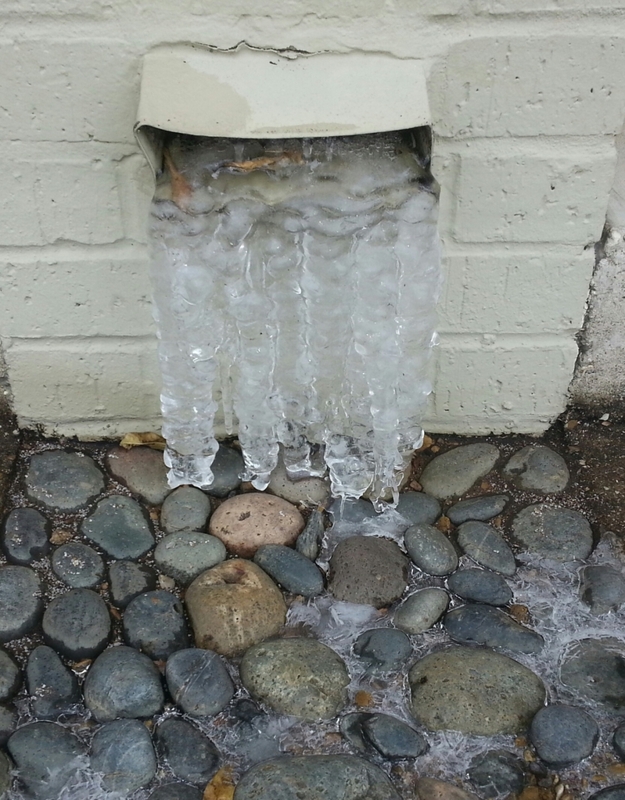 The results of the cold were amazing, including this storm drain that froze in solid icicles. The baby broccoli plants in the front yard didn’t get covered. So far, they look like they might make it. If we have another freeze event like this one, I’ll cover them. So, Winter, you’ve had your chance. You can move along now, because I’ve had my fill of below-freezing temps. Do you think Winter will listen? What do you do to stay warm during weather events like this? Are you prepared for the next ice storm?